What you wear, where you stand, how you stand, how you hold the microphone and a number of other factors can dramatically affect your worship leading, and this is what we are going to explore in this week’s podcast. 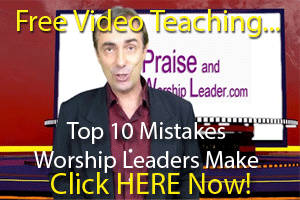 Let’s face it when you lead people in worship you need to consider the whole package. People usually worship with their eyes open, so they are looking at you, taking in the entire scene. And trust me, your congregation will notice everything! So we talk about what you are wearing, how you are holding the microphones, where the band members are placed and a ton of other stage presentation issues. Everything we share on stage presentation in this special pod includes practical and easy ways that you can change and improve any deficiencies, so if you want your team to not only sound amazing and lead incredible worship, but also look sensational, then this podcast is not to be missed! Even the little things, the ones you may have never even considered, are dealt with in this podcast. We also share how you can change how the entire band presents itself, not as stone statues on stage singing and playing, but as real people relaxed and enjoying the worship, and interacting with each other in a way that presents as natural, stylish and cool! We even make a stand against the current trend of blackening out everything, suggesting we can have colour and vibrancy in our churches instead of drab black! So, we may slay a few holy cows in this podcast, but I believe that in the end what the team suggests will be a great blessing to you, and definitely not that expensive to implement (we are basically cheapskates at heart! ).